CHILE: Chile's congress has approved a new transmission law, which the government says will help the development of the country's renewables potential. Chile has seen significant investment in renewable energy since 2010, including almost 1.5GW of wind capacity in operation or under construction. 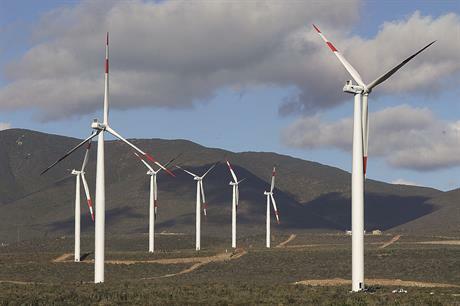 But some projects have been hindered because of delays in building new power lines, and the lack of transmission capacity has left some wind farms supplying electricity for free. By granting greater planning powers to the state and more incentives to build new lines these barriers would be overcome, the government said. "The country needs more clean energy and lower electricity bills, this law helps us fulfill that objective," said energy minister Maximo Pacheco after the vote on 6 July. The minister called the new law the most significant reform of Chile's electrical sector since it was liberalised in the 1980s. "This is a change of paradigm because transmission will stop following generation, rather it will be transmission which drives generation," Pacheco said. "We are going to be able to move clean and cheap wind power... to Valparaiso and Santiago," the minister added. The new law also transforms the way transmission is paid for to favour smaller generators. Rather than forcing the generator to shoulder the cost, consumers will bear 100% of the cost of transmission, removing a key disincentive against remote wind-farms and small hydroelectric plants in favour of large thermoelectric plants.